The ASUS VE278Q 27" Widescreen LCD Monitor leads you to enter a big and spectacular world of colors with Full HD 1080p (1920 x 1080) support and HDMI port. AI light function enables the VE278Q automatically adjusting to lower brightness and make your eyes feel more comfortable in the dim environment. Furthermore, it helps save more 25% power consumption. Embedded digital HDMI and DisplayPort inputs, VE278Q enables the most advanced graphic cards/computers connection. The DisplayPort interface also offers better support of multiple display streams, longer cable connection, and interoperability with other inputs, such as VGA, DVI and HDMI. Need to research on the Internet, but a championship game is about to start on TV? The ASUS VE278Q 27" Widescreen LCD Monitor offers PIP (Picture in Picture) function (via hotkey) and has the capability to display images of two different signals at the same time. 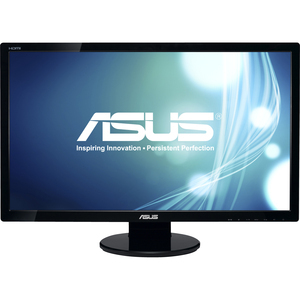 Product Description: ASUS VE278Q, LCD display, TFT, 27"